PDF or Portable Document Format is one of the most common and popular document formats used for creating and sharing documents. PDF documents can contain information in both text and image formats. 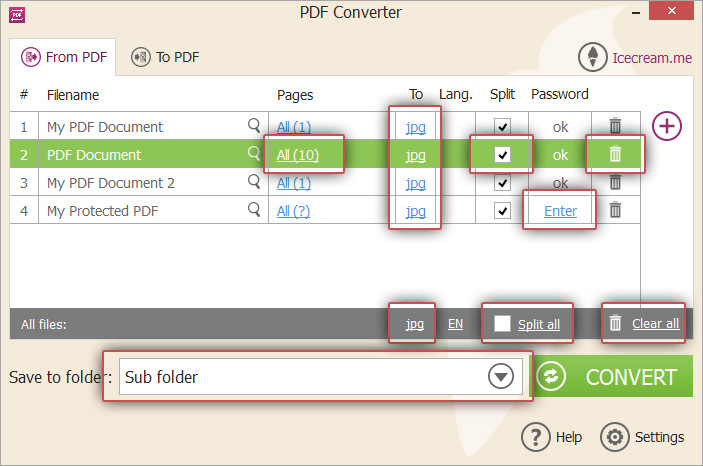 If you want to process, embed, edit or easily share the contents of a PDF file, you can convert it to a JPG format using Icecream PDF Converter. This software allows easy conversion of documents to and from PDF and other formats, including PDF to JPG. JPG is a popular format for image files. If you convert PDF to JPG format, it will allow easier image processing, embedding the content to other documents. PDF documents can be converted to JPG format by following the steps below. To start using the program, download Icecream PDF Converter from its official website. Follow the steps in the installation wizard to complete the setup of the software. Once it's complete, open the installed program proceed with PDF to JPG conversion. Select the “From PDF” option in the welcome screen to convert files from PDF to JPG. Click the “Add PDF File” button to select and add the PDF files stored on your computer with the help of Windows Explorer. The added PDF files will now appear in the application window. If you wish to add more PDF files to convert, select the PLUS (+) icon in the right hand side. As an easy alternative you can simply drag and drop the files into program's window. 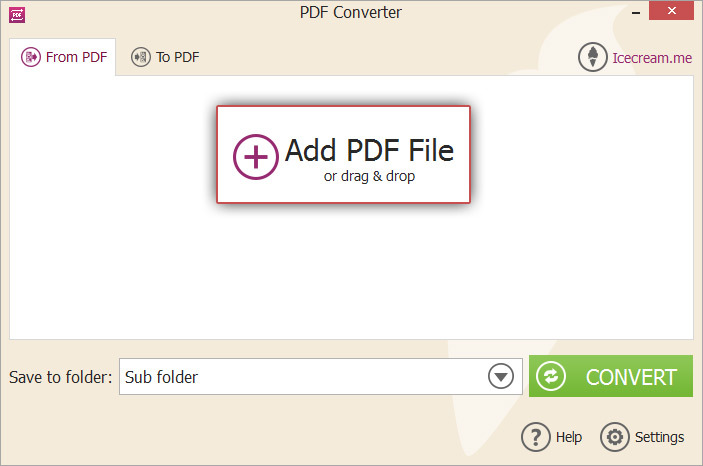 Icecream PDF Converter allows previewing added files – to do that click on a magnifying lense to open an added file in a new window. Note that for protected files you first must insert a valid password. By default all the pages of the selected file will be converted to JPG format. Alternatively, you can specify the detached pages or page ranges of a file that should be converted. Click on the hyperlink in the “Pages” column and enter the “From” and “To” ranges of the page numbers and then click “Add”. You can add multiple ranges of pages, remove the individual values or clear all the entered values by pressing “Clear” button. Intervals of pages and individual pages may easily overlap each other. Select OK to save the inserted pages values. JPG is selected as the default conversion format and you can see it in “To” column that shows outpur format for the conversion. You can specify the format for each file individually or use common settings for all the added files located under the table with the added files. 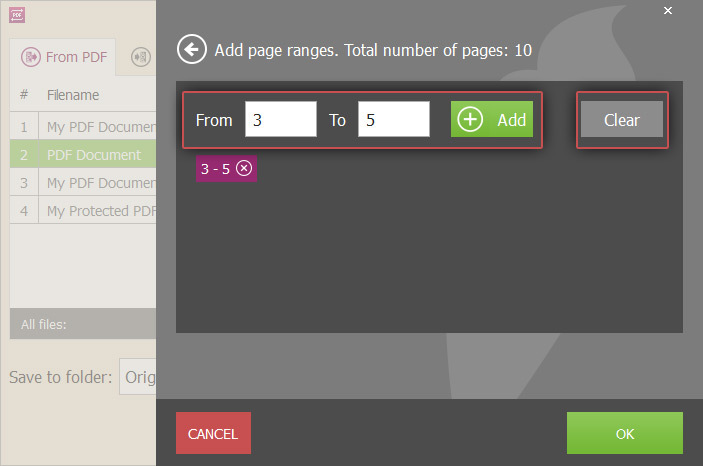 Select the Split option if you wish to convert each page of the PDF document to a different JPG file. The “Split All” checkbox will check the Split option for all the selected files. Use the delete icon to remove any of the selected files one by one, or use “Clear all” option in the common settings area to remove all the selected files at once. Icecream PDF Converter works with password-protected PDF files. As soon as such file is added, in the “Password” column corresponding it will appear “Enter” value. To insert a correct password for such a file, click there to open a new window with the interface to enter the password. If the password is correct, the value will turn to “ok”, it is also applied to unprotected files. In case the password is not inserted or it's incorrect, the program will skip working with this file. Select the target folder where the generated files will be placed by selecting one of the listed values from the “Save to Folder” dropdown: Sub Folder (the converted files will be created in a new subfolder in the same folder as the selected files); Original Folder (the converted files will be placed in the same folder as the selected files); Select Folder (user can browse and select any folder .The converted files will be placed in this folder). Verify all the added files and all the tweaked settings and click “Convert” to start the conversion process. The current status of conversion including the file and page numbers and the elapsed time will be displayed in the progress bar. You can suspend the conversion process by pressing the “Pause” button or terminate it at all the by pressing the “Cancel” button. Once all files are converted, a confirmation message will appear with an option to open the destination folder and view the converted files. 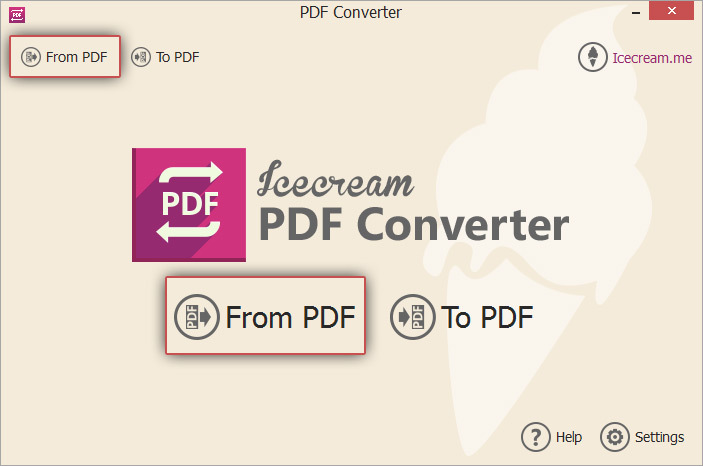 Now you know how to convert PDF to JPG with Icecream PDF Converter.